How appealing are tax credits as an incentive to hire ex-offenders? How appealing are staffing agency discounts and guarantees as an incentive to hire ex-offenders? Might people with felony records get more job offers if they could provide detailed information about their previous work performance? What are the most important potential issues of consideration in hiring someone with at least one felony conviction? The rate of criminal punishment in the United States has had far-reaching economic consequences, in large part because people with criminal records are marginalized within the labor market. Given these negative economic implications, federal, state and local officials have developed a host of policies to encourage employers to hire ex-offenders, with varying degrees of success. To inform policies and programs aimed at improving employment rates for ex-offenders, we examined employer preferences regarding policy options targeted to incentivize hiring individuals with one nonviolent felony conviction. In our experiments, we found employers were 69 percent more likely to consider hiring an ex-offender if a hiring agency also provides a guaranteed replacement worker in the event the ex-offender was deemed unsuitable and 53 percent more likely to hire an ex-offender who can provide a certificate of validated positive previous work performance history. Having consistent transportation provided by a hiring agency increased the likelihood of being considered for hire by 33 percent. Employers also were found to be 30 percent more likely to consider an ex-offender for hire if the government increases the tax credit from 25 percent of the worker’s wages (up to $2,500) to 40 percent (up to $5,000) — double the current maximum amount allowed by the Work Opportunity Tax Credit — and 24 percent more likely to hire an ex-offender if the government completed all tax-related paperwork. With a baseline policy of a discount on a staffing agency fee set at 25 percent of the hourly wage and post-conviction certification verifying adherence to company rules or code of safe practices, 4.3 out of 10 employers would consider hiring an ex-offender. With the same baseline policy and a guaranteed replacement worker program, in which an agency would send a replacement worker if the ex-offender is unsuitable, that number rises to 7.3 out of 10. Six in ten employers would advance a candidate with this professional and criminal background if the candidate used a staffing agency with a 50-percent discount instead of a 25-percent discount. With a baseline policy of a tax credit for 25 percent of a worker's wages (up to $2,500) after a worker has put in 120 hours and a post-conviction certification verifying adherence to company rules or code of safe practices, 5.9 out of 10 employers would consider hiring an ex-offender. With the same baseline policy and a 40-percent tax credit (up to $5,000), the number rises to 7.7 employers out of 10. Seven in ten employers would advance the candidate if the government, rather than the employer, completed the relevant tax forms to receive the tax credit. With the same baseline policy as considered for tax credits and a certificate of validated work performance history, that number rises from 5.9 out of 10 employers to 8.1 out of 10. From a specific list provided in the survey, the top-cited concern was "any violent felony conviction," which was chosen as the most important issue by 53.3 percent of respondents and as the second most important issue by 24.5 percent of respondents. This may partially reflect concerns related to negligent hiring liability, but it may reflect other issues, as well. Another primary concern stated by employers was "skills to get the job done," which was ranked as the first or second most important issue to consider by 45.4 percent of respondents. 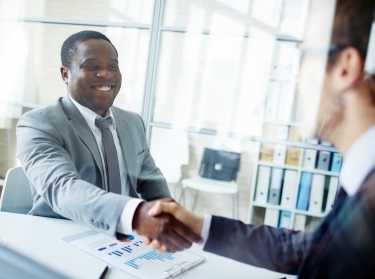 Staffing agencies and reentry or reintegration programs could increase the likelihood of employment for people with a criminal record if they guarantee prospective employers a replacement employee. State policymakers should consider expanding post-conviction certification programs. Across both the tax credit and staffing agency discount experiments, employers demonstrate a clear preference for wanting to know whether an ex-offender job candidate has a consistent work history and verifiable positive employment references versus simply knowing whether the person follows company codes of conduct. Tax agencies should consider reducing the paperwork that companies have to fill out for credits. Government agencies could also consider providing help to prepare and submit the forms. Ensuring reliable transportation to and from a job site for candidates with a criminal record increases the likelihood an employer will support hiring such individuals. As with reducing paperwork, the impact of this policy is more limited than many of our other tested policy features. 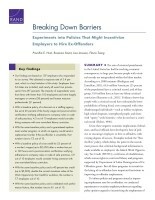 Incentivizing Employers to Hire Ex-Offenders: What Policies Are Most Effective? Dionne Barnes-Proby, Priscillia Hunt @PriscilliaHunt, et al. This project is a RAND Venture. Funding was provided by gifts from RAND supporters and income from operations. The research was conducted within RAND Labor and Population. Hunt, Priscillia, Rosanna Smart, Lisa Jonsson, and Flavia Tsang, Breaking Down Barriers: Experiments into Policies That Might Incentivize Employers to Hire Ex-Offenders. Santa Monica, CA: RAND Corporation, 2018. https://www.rand.org/pubs/research_reports/RR2142.html.